But please link to this page if you do! The Dreamcast has been a very lucky console, with more games officialy released by third parties after the console's official demise than any other console I can remember. And they're good games too, made from quality stuff - Treasure's Ikaruga and SNK/Playmore's King of Fighters foremost on the list. Now we can add G-Rev's Border Down to the top five post-death releases. 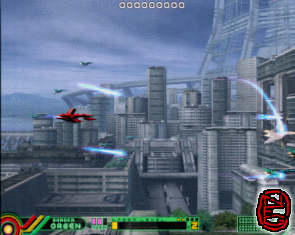 G-Rev is a relatively new company formed by ex-Taito coders who were responsible for a few recent shmups, including G-Darius. This is their second release so far, the first was a largely ignored Minesweeper variant released on Naomi, DC, and cellular phones. Border Down is more mainstream, and should see a decent audience on the Dreamcast after Ikaruga reminded people that shmups are fun. My initial impressions of this game are more or less the same as the ones I had after playing the arcade release: it's a solid horizontal shooter with decent graphics and a few gameplay twists. There's nothing exceptional about this game at all, and a few parts are downright substandard, but as a whole it's a rewarding experience and certainly worth the purchase price. The game's title is derived from a rather unique feauture: each level has three routes to the end boss, and each is called a Border, and is assigned a colour. The Green border is the beginner border. The player starts with three lives and takes the easiest path to the boss. When a life is lost the next Border is taken, and when you die on the last Border the game is over. You can choose to start on any of the three borders, but you only get as many lives as the Border you choose. Start on the Red Border and you've got only one life. Another neat perk is the boss timer and damage gauge. You can tell how close the boss is to death, and the closer the timer is to zero when you kill the boss the more bonus points you'll receive. This adds a nice amount of complexity to the boss fights as you try to balance your shooting, dodging, and the timer. Between this and the different level paths there's a fair amount of replay value to the game. 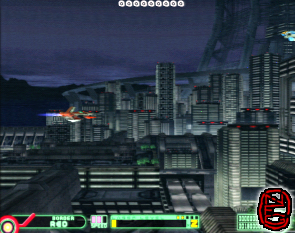 The game levels are very standard shooter fare. 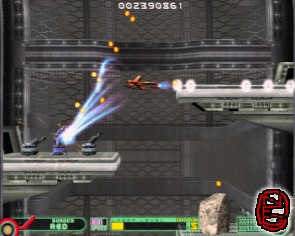 If you've played Darius, R-Type or Gate of Thunder there's a lot of things you'll recognize. Flying over a city, through mining operations, vertical shafts with moving platforms - it's all here, and there's nothing new to report. The backgrounds are nicely detailed and mostly monochromatic, making it easy to discern the more important foreground objects from irrelevant scenery in the heat of battle. Lighting effects are nice, with plenty of laser transparencies lens flare. The game has yet to lose its lock on a silky smooth 60fps, except for fancy boss explosions slowed for effect a la Ikaruga. 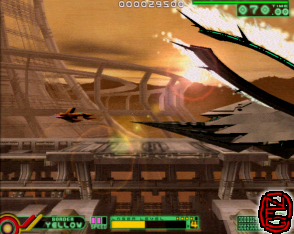 The music is standard Taito/Zuntata stuff. Personally I hate elevator music, and I hate this crap 'cause it sounds the same. Shooters should, IMO, feature swooping orchestral tunes, techno, or electric guitars. Or any kind of up-tempo music with a little drive to it. If you've played Raystorm or Darius you know what to expect, and it's something of an acquired taste. The ship designs are the game's weakest point, as far as I'm concerned. Overly complicated and amateurish designs throughout, with entirely unremarkable enemies excepting the first stage boss. The main player ship appears to be made by a skilled but unfocused artist, and features many lumps and surfaces and wings and spoilers. 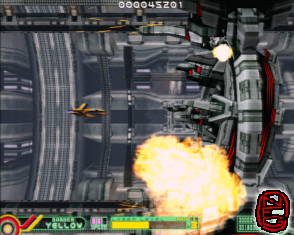 Enemy ships are instantly forgettable, or seem out of place, like the turrets in the 2nd stage mine. It would have been nice to see ships with some sort of design consistancy, and I'm sure some people will like them, but most all other shooters feature better looking enemies and player ships. Bottom line? Entirely competent. Aside from the music and the disappointing ship designs there's nothing to complain about except perhaps a lack of innovation. 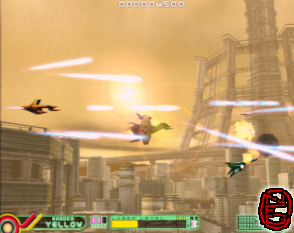 If you love a good shmup, especially a horizontal one, you can do far worse. In this modern era you may find it's hard to do better in this vein.